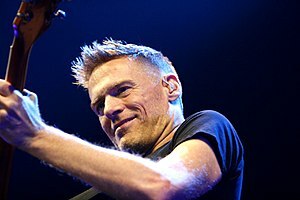 Bryan Guy Adams (born 5 November 1959) is a Canadian singer, songwriter, record producer, guitarist, photographer, philanthropist and activist. Adams rose to fame in Canada and the United States with his 1983 album Cuts Like a Knife and turned into a global star with his 1984 album Reckless, which produced some of his best known songs, including "Run to You" and "Summer of '69". In 1991, he released "(Everything I Do) I Do It for You" from the album Waking Up the Neighbours; the song was written for the film Robin Hood: Prince of Thieves and became a worldwide hit, reaching number 1 in many countries, including 16 consecutive weeks in the United Kingdom, a new record as well as 72 weeks in the top 20. I watch everybody every night, from sitting down to being on their feet at the end, and I feel a sense of reinvention, of caring, presenting these songs in their purest form. If your music is great, you will have fans, not because you have spent time chatting on social media. Music is just such... it's not therapy, but it's a release, it's a joy, it's a pleasure. And it's a job - which is weird, because I don't think of it as a job. I do 100 shows a year, but I do it in fits and starts, as opposed to going on a long run. I've never been enamoured by the idea of being a celebrity. I never took a grant or borrowed a penny from anybody. It was partially because I didn't really know how to do that, but secondly, my pride never would have allowed me to. In the beginning it was about doing it the right way, on the merits of the music. There's not an instruction manual on how to deal with success, so you just have to rely on having great friends and a good team. I like to be able to present myself in two or three different ways because I've never really wanted to rest on my laurels and be something that people expected. I think a lot of people want to be remembered the way they were, as opposed to the way they are now. Trying to manage diabetes is hard because if you don't, there are consequences you'll have to deal with later in life. I think I'm better behind the camera than I am in front. I pack every minute I can with something to do. To be a celebrity, I couldn't think of anything more cringe-worthy. Social media is a giant distraction to the ultimate aim, which is honing your craft as a songwriter. There are people who are exceptional at it, however, and if you can do both things, then that's fantastic, but if you are a writer, the time is better spent on a clever lyric than a clever tweet. I remember being in Hollywood at the age of 16 and marveling at the stars. The idea of being part of it never entered my mind. It was too far-fetched. I grew up with British rock. I've always wanted to push myself and move with the tide. That's just how I am and it's worked for me. I feel quite sad for the young musicians coming up because they may never get to pay their rent properly. It doesn't matter what the genre; nowadays, it's so much harder than it ever was. I've only ever trusted my gut on everything. I don't trust my head, I don't trust my heart, I trust my gut. Music became my focus. At 13, I was jamming with my mates. At 15, I was playing clubs. I'm a complete and utter busker. I moonlight as a singer. I'm amazed every time I come back to Vancouver at how much it's changed. You go away for a month and there's three more skyscrapers. I never had a long-term plan. I'd been round the world a hundred times and had started to forget where I'd been. I knew I'd been there: it said it on the tour map. I could remember the name of the city but I couldn't remember what it was like - it was a massive blur. I don't like long tours. I find it much easier to go out for a short spurt every month. I need to be able to rock out. I always just wanted to be the singer or the bass player in the band. I'd love to have a band, where I was obviously the singer, but where it wasn't me, it wasn't my name. I like the idea of helping people help people. I always knew I'd be in music in some sort of capacity. I didn't know if I'd be successful at it, but I knew I'd be doing something in it. Maybe get a job in a record store. Maybe even play in a band. I never got into this to be a star. Focus on your music and not technology.